Nabulungi (Syesha Mercado) falls for Mormon missionary Elder Arnold Cunningham (Ben Platt) in the Chicago production of "The Book of Mormon." 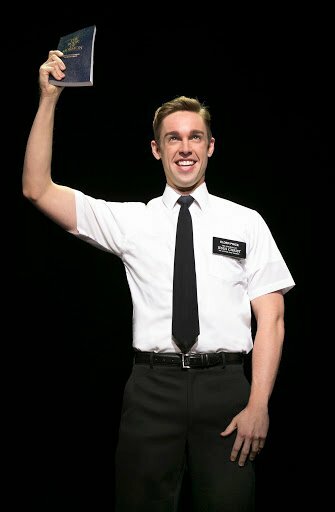 Nic Rouleau plays Elder Kevin Price in the Chicago production of "The Book of Mormon," playing at the Bank of America Theatre. The cheerfully profane show has finally opened at Chicago’s Bank of America Theatre after months of hype. Local news outlets have reported that the run is sold out through March 3, leading to an extension — likely the first of many — to June 2. What makes these Mormons so much fun is silly “South Park” social satire packaged as a traditional song-and-dance musical. Amid not-so-subtle commentary about white privilege and the preposterousness of certain religious beliefs are energetic dance numbers and several dangerously catchy tunes. The elders’ training in Utah has left them somewhat unprepared for this. The brightest star in Chicago’s production is Ben Pratt as Elder Arnold Cunningham, a variation on his awkward-roommate role in the fall movie “Pitch Perfect.” With no concept of social boundaries, a desperate need to be liked and a blind enthusiasm that makes his fellow elders cringe, Arnold makes his religion up as he goes along with disastrous results. But former “American Idol” finalist Syesha Mercado is perfectly cast as Nabulungi, a trusting village girl with dreams of “Sal Tlay Ka Siti,” “where flies don’t bite your eyeballs, and human life has worth.” As naïve as Cunningham, Nabulungi’s romantic duet with him (“Baptize Me”) is at once touching and mildly scandalous. Choreographer and co-director (with Parker) Casey Nicholaw gives the Mormon corps plenty of goofy, high kicking, jazz-handsy dance numbers, led by Pierce Cassedy as the gay-but-not-really Elder McKinley. Cassedy takes a minor role and runs away with it, tap shoes clicking merrily. Like “South Park,” “Book of Mormon” trades on a casual irreverence about the Important Things. Jesus appears in a robe lined with Christmas lights (costumes by Ann Roth); Elder McKinley insists his homosexuality is “a curable curse.” While Parker and Stone draw on real tenets of the church, if anything, Mormonism seems less comprehensible by the end of the show. But “Book of Mormon’s” ultimate message, while deliciously subversive, remains hopeful. Uganda changes the elders, and they, incredibly, change it. Take out the naughty words and the sexual innuendo, and “Mormon” has a heart of pure gold.